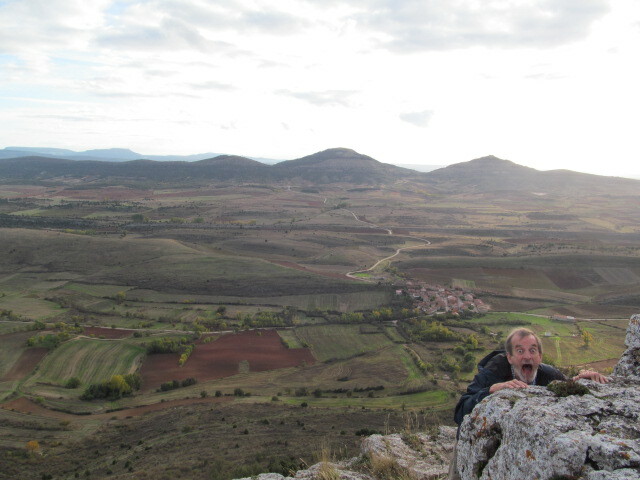 I went back to the little Visigothic chapel in the isolation of the northern meseta in Spain, landscape that was adapted by Sergio Leone years ago to make The Good, the Bad and the Ugly. 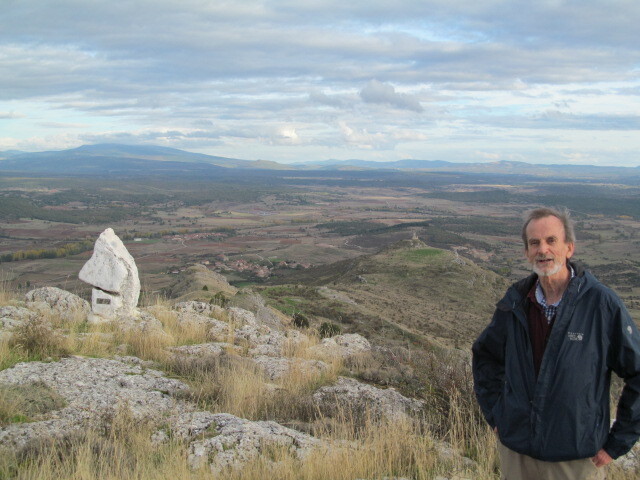 Outcrops of rock, mesas, sierras, rolling fields of various soil colours, vineyards, forests, scrub land, tiny centuries-old farming villages each with their church tower. I have come to love this landscape. I arrived at the ermita yesterday morning, totally surprising him. I had made it clear that I was staying in the northeast and not taking the long detour to visit. I had visited in April when I was travelling in the central part of the country. Daily phone calls upon my arrival repeated this decision. I lied and found it easy to do over the phone. I even had the audacity to call him about 45 minutes before I showed up, claiming I was far away in the Pyrenees, but feeling somewhat sad that I hadn’t decided to make a quick visit. Such deceit! It was fun. 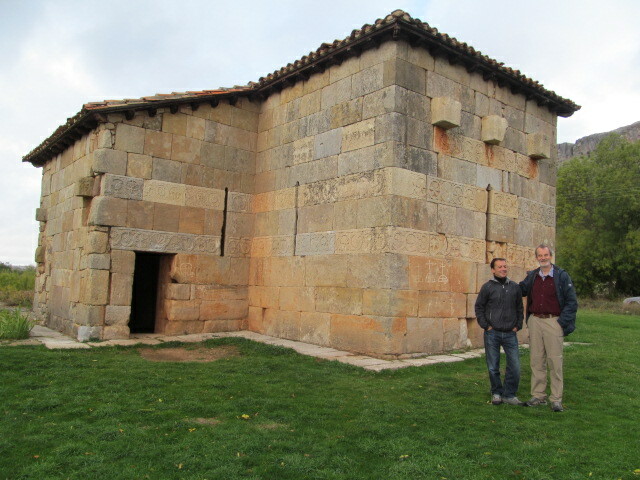 Here we are in front of the ermita (with the help of some French tourists). 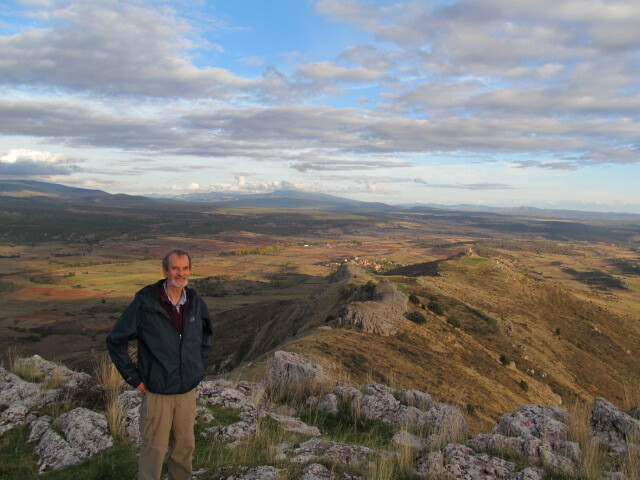 We spent about 6 hours chatting in Spanish, catching up, sharing photos, talking to a number of tourists who showed up. He suggested a hike at closing time in the nearby woods. 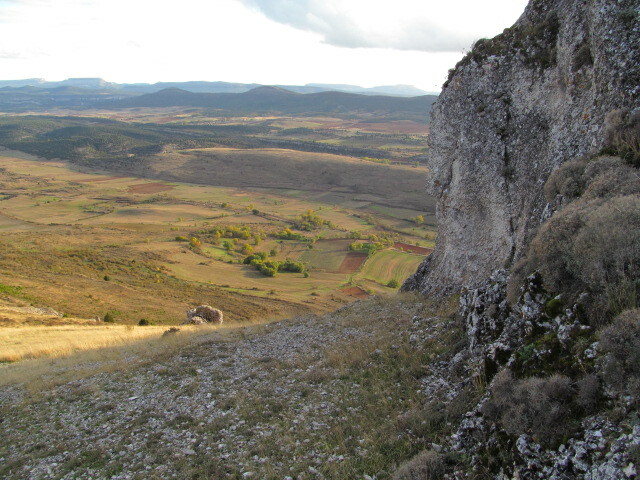 I wanted to climb up the Peña. No problem. About half way – wonderful play of light and shadows, continually changing. I’ve made to the top; in the spring, those distant mountains are always snow-capped. We sat on the ledge for a while and then I needed to be silly. As the late afternoon progressed, it became sunnier with a wonderful play of the light on the autumn colours below. 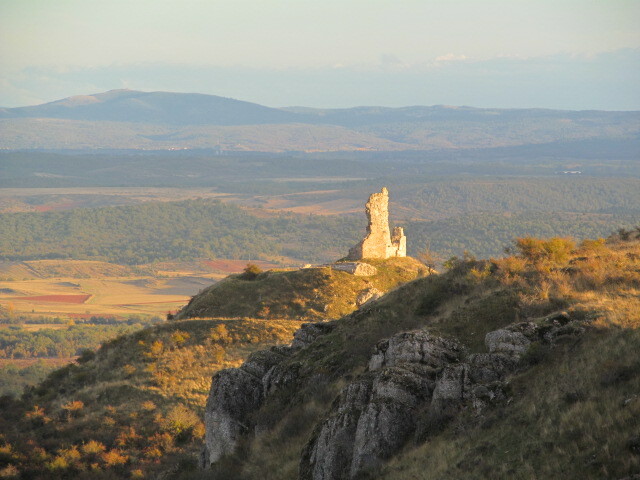 The final two are my favourites, the evening sun in the valley framed by the rocks and the distant hills, and a close-up of the ruins of a tenth century castle – pretty good sense of depth! I am realizing that Antonio has not appeared in any photos, although he is in the tail end of the video. 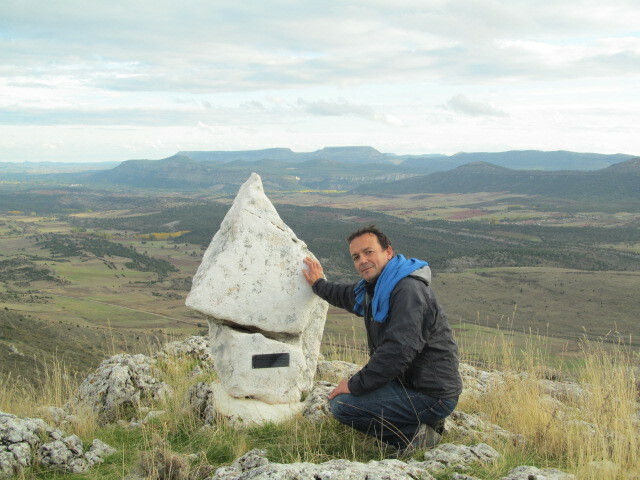 Here he is, a live and well beside a memorial to a young person from the area. He is very active and often does this climb on his own after work. I slept a full nine hours after this. I will be back hopefully in this area in the spring. 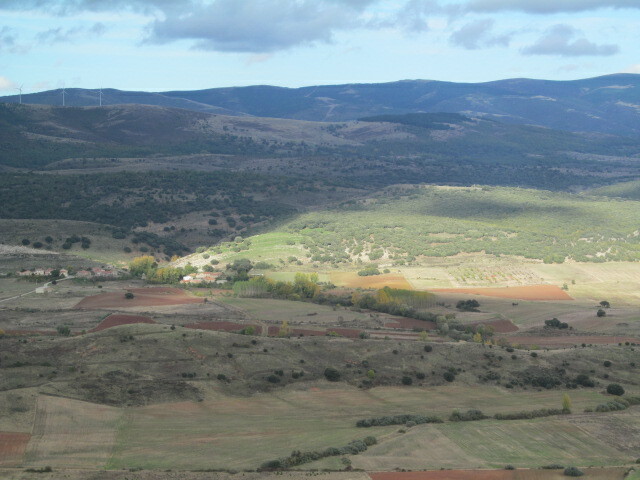 I have come to feel very at home in this landscape and in the nearby village of Covarrubias. Walking into this village an hour or so later, the woman who runs the small gift shop specializing in local products, jams etc., recognized me from the accumulation of my earlier visits, purchases and conversations. Such a good feeling! This entry was posted in Uncategorized on October 24, 2013 by agnotarte. It sounds like such fun! What a lovely surprise – and what beautiful country!